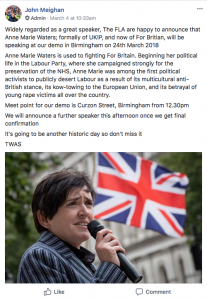 Supporters of the Football Lads Alliance (FLA) have universally welcomed a decision for Anne Marie Waters to speak at their next march in Birmingham later this month. FLA founder John Meighan broadcast the news on Sunday morning and messages of support have since come flooding in on the groups private Facebook page which has over 65,000 members. Anne Marie, an outspoken critic of Islam and leader of For Britain party, will now be the headline speaker when football fans from the FLA march in the second city on Saturday 24th March. “Game changer that one,” said one FLA supporter, signalling his approval of the announcement. Other supporters urged the event to once again pass off peacefully, with no arrests being made at the first two demonstrations in London last year which saw tens of thousands pour out onto the streets. The FLA will march from Curzon Street, close to Birmingham City University, on a pre-agreed route into the city centre from 1pm. A second speaker has since been confirmed in German Aline Morars, who recently co-founded the 120 decibel movement highlighting the rise in sexual violence against women at the hands of migrants. The Football Lads Alliance was founded in June 2017 by property manager Meighan in response to the London Bridge terrorist attack and Manchester bombing where a suicide bomber targeted mainly women and children at an Ariana Grande concert. Who is John Meighan? Find out here.